– I get to do other things I like (hobbies) and spend more time with my family. These insights are keenly felt for a little boy his age but I’m sure he’s not the only one feeling this way. The truth is, everyone of us, has something or other to say about the Singapore education system. 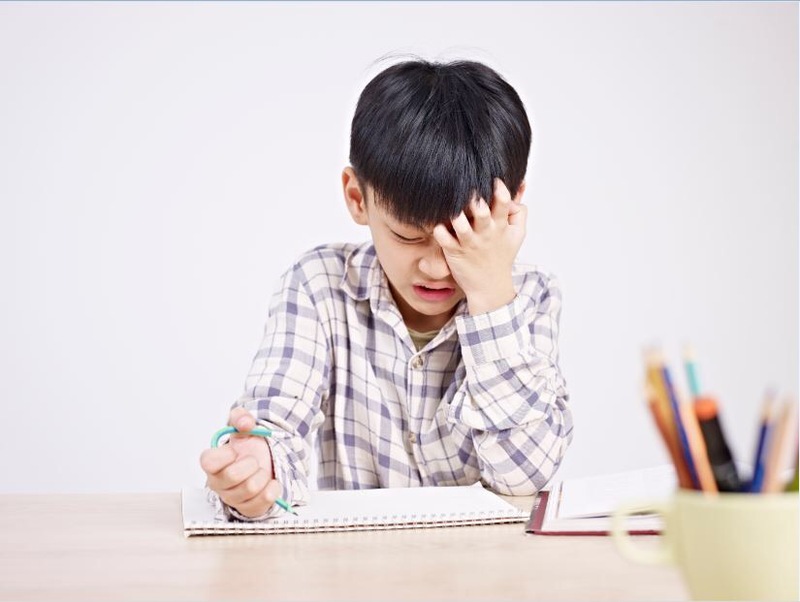 More often than not though, we keep our grumbling to ourselves, nag out our frustrations on our kids and try to keep the lid of pressure down with remedies like tuition while trying to remind ourselves not to be caught up in the educational arms race. To be honest, nobody really wants to be left-behind and we end up like hamsters in a spin wheel trying to keep up. At the heart of the issue is: what drives us to be “kancheong”, “kiasu”or “kiasi” or rather, how NOT to be? Well, a group of good people have come together to start this much-needed conversation. 1. In a nutshell, why this play and why forum theatre? What is at the heart of this work? For years, we have been in pressure-cooker education environment. There has been a lot of talk on this, but the situation remains. Why? Education is a complex subject involving many stakeholders. There is no single solution. To reform this, we need to have deep conversations with all stakeholders, so we grow understanding and empathy for each other. Only then, can we effect changes. “Don’t Kancheong, Kiasu & Kiasi’ facilitates this conversation by giving every stakeholder a voice to engage with one another. 2. What stories, narratives & conversations does this work hope to bring out? The actors will demonstrate the challenges and conflicts in the 4 acts below. – a family quarrelling over a child’s exam results. – an overwhelmed teacher struggling with self-harming students. – a Principal and MOE Director at a loss to eliminate youth suicides. – a worry-stricken CEO who can’t find innovative local employees. Audience can share their opinions, change the scenarios or offer alternative solutions to the actors in the hope of producing new outcomes. The forum theatre format helps us to see the perspectives of different stakeholders and start a conversation on the baseline of empathy and betterment. We hope the audience will walk away with broader perspectives and greater empathy for all stakeholders. We hope the work can trigger deeper self reflection and drive changes in our behavior that can alleviate pressure experienced by our children. We hope the audience can see the great misunderstanding that results in misaligned goals, which drive us all into a narrow rat race and pressure-cooker education culture. 3. Who should attend and why? 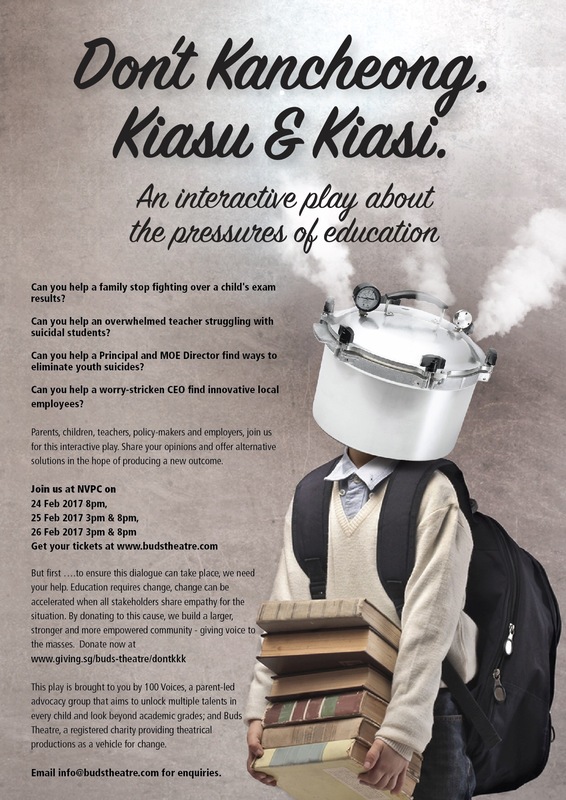 Parents, children, youths, teachers, principals, MOE policy makers, college enrollment officers, recruiters, employers should watch this play as they are influential actors at different stages and parts of education system. If we can start off by understanding challenges faced by each stakeholder, we can then take the conversation to deeper level to uncover underlying reasons (or triggers). From there, we can explore solutions to reform our education in impactful and inclusive manner. Reform comes from everyone taking his/her own actions to make changes in alignment. 1. You (the audience) don’t have to sit still and keep quiet throughout the play, unlike the typical performances. 2. You are the Director! You get to tell actors what to do. 3. Your suggestions will be heard by MOE Officials for consideration in shaping the education system. You will get to know others who face similar challenges like you – you can take heart that you are not alone! 2. Leave a comment on what makes you kancheong, kiasu or kiasi as a parent! *The giveaway will end on Wednesday, 22 February.